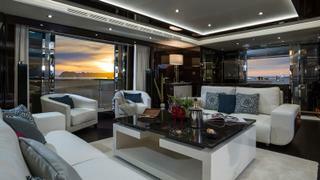 It’s hard to imagine that a yacht that packs in so much entertainment can at the same time offer so much calm. 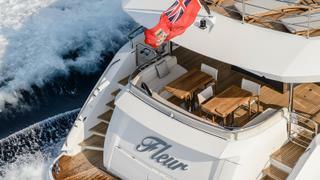 As I step on board Fleur, the second of Sunseeker’s 116 Yacht series, skipper Rob Frost is quick to point out the surround sound in the generous social spaces — we count 24 speakers on the bridge and main decks alone. 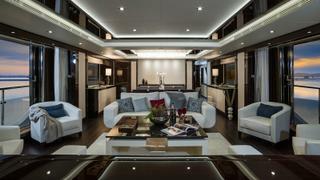 “It’s the first yacht with a complete and thorough Bang & Olufsen audiovisual system,” he tells me. It’s a system that costs about £100,000, taking into account the TVs, speakers and amps. Each speaker can be controlled independently, allowing louder volume in open areas and quieter under cover or closer to the bridge. Contrast that with the hushed surroundings of the four en-suite guest cabins, reached down a lushly carpeted staircase. With huge port lights letting in the sea’s sparkle to play on the walls and silk headlining, you feel at once connected to the water just a metre below the window and lulled by the quiet. These large ports are a key part of what sets Fleur apart. Viewed from the quayside, the darkened glass strikes a dramatic contrast to the gleaming white GRP of the topsides. There are no fussy frames or exposed mullions to clutter the expanse of glass, which stretches away to the bow. 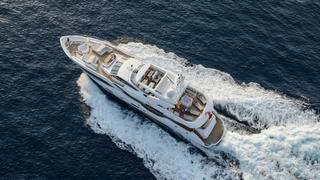 The boat’s lines are bold and straight, and completely at one with her top speed of 26 knots. 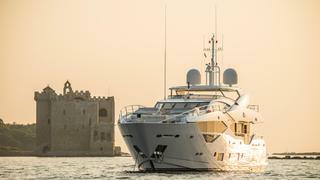 With Sunseeker’s comprehensive custom programme, owners can get as involved as they like in the specification. 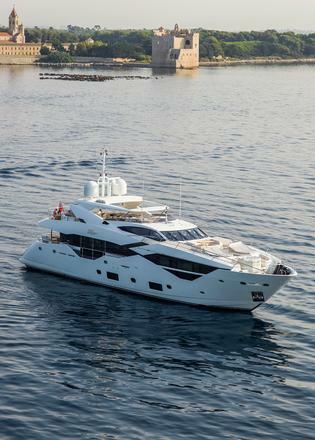 That includes “interior design materials, cabin layout, external areas, and technical equipment within reason”, says Bryan Jones, marketing manager at Sunseeker. For Fleur, the rich deep hues of wenge for floors and cabinetry contrast with the light shades of the pearl-toned fabric panelling, Zimmer + Rohde upholstery and polished Thassos marble detailing. Fleur is rated to accept 10 guests overnight or up to 12 during the day. The formal dining table would easily accommodate that number of dinner guests, spoilt with meals from the well-equipped galley on the port side. But in her natural Med habitat, this yacht favours outdoor living thanks to a pair of huge folding teak tables aft, ringed with deep, comfy seating. 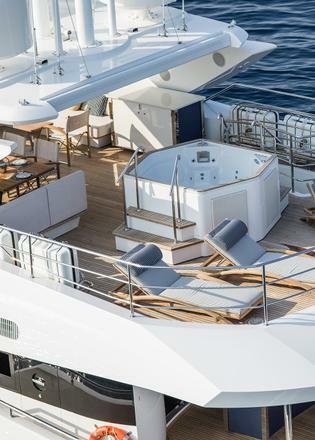 Should this area feel too far out of the cooling breeze, the huge flybridge above, with its silent sunroof, has low tables for dining, a wet bar, large flatscreen TV and even a five-person superyacht spa pool. Or you could head for the forward cockpit, which sports two teak tables that lower into sunbeds with backrests adjustable at the click of a button, further sun loungers and a second spa pool. “We can rig up four carbon fibre posts here to provide an awning, as well as a projector screen for outdoor viewing,” says Frost. As elsewhere on Fleur, high-quality audio and heaps of power points are built into this area. 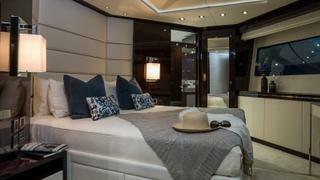 The coup de maître without doubt is the full-beam owner’s suite, forward on the main deck. With two walk-in wardrobes and a huge king size bed, this space takes maximum advantage of the floor-to-ceiling windows that are so striking from the outside. Light floods in and gives an unrivalled view of the sea on both sides. Again, top-notch AV equipment includes a large B&O television on the forward bulkhead, and the high gloss finish of wenge panelling reflects the light into every corner of this space. “You hardly need the mirrors in here,” says Frost. 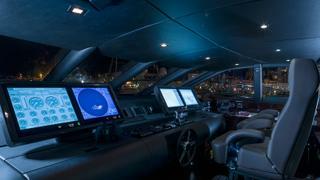 It goes without saying that a yacht of this complexity requires a serious technical backbone. 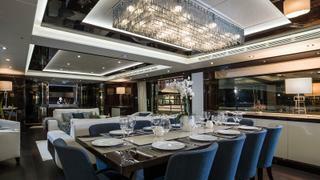 Frost can direct most of what goes on from his leather and wenge panelled eyrie on the bridge. The space is deceptively simple: four large screens from Tijssen, giving instant access to a chartplotter, radar screen, infrared camera and, crucially, digital control over every system on board. From here he can see whether there’s water in fuel filters, a pump alarm sounding or even something wrong with the galley extractor fan. 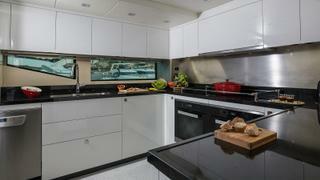 There’s an elegant curved companionway to the flybridge, with its full outdoor nav station. But one of the most useful design touches is the hydraulically operated gull-wing door that gives access from the bridge to the port side deck running forward to the seating area at the bow. Frost reports that Fleur handles well for a yacht of this size. She’ll happily turn in her own length using bow and stern thrusters, but even at speed, on the high seas, she manoeuvres neatly in a seakindly fashion. One of her first passages had her weathering 40-knot winds and heavy swell on the nose. “I wouldn’t have been happy out there in another boat,” Frost says. The technical space below houses two 12V M96L engines from MTU, delivering 2,637hp each, plus fail-safes for all key systems, including pumps, air con and more. This was specced by the clients so that guests should never be troubled by mechanical problems. Fleur can make 550 litres of fresh water an hour and there are two 70kW Kohler gensets to keep even the most demanding guests fed, watered and entertained. 6.25 metre Williams Dieseljet tender. There’s room for two Jet Skis, four SeaBobs and a host of other superyacht water toys to keep children and adrenaline junkies entertained. 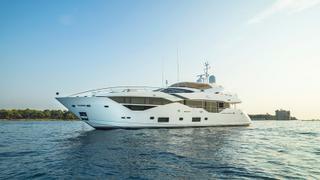 At close to £11 million ex VAT, the Sunseeker 116 Yacht is not cheap. But then again, you’ll have that serene interior to help you regain your composure before you set off for your next adventure.